Here is an easy lunch idea that takes only minutes to put together. 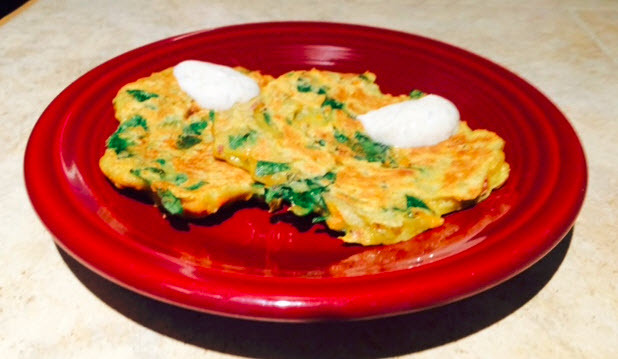 I love potato pancakes, so I thought a pancake made with multiple vegetables would be even better… and I was correct! These savory pancakes are extremely flavorful. Enjoy! Place the grated and julienned vegetables in a bowl and stir until mixed. Whisk the egg and milk in a separate bowl and pour over vegetables. Whisk the flour, baking powder, spices and salt together in a bowl and sprinkle over the vegetable mixture. Stir to combine. Melt about 1 tsp of coconut oil in a frying pan. Place 1 tablespoon of vegetable mixture in pan and cook for 3 minutes on each side or until golden brown. Top with sauce* and serve warm. *For the sauce, combine all ingredients in a bowl. Serve pancakes with a dollop of the yogurt sauce.